Focuses on the basic skills that a trained bystander can perform in response to a cardiac event, or choking victim. Students will also learn how to operate an Automated External Defibrillator (AED), an electronic device that can detect a heart rhythm, and provide a shock to a victim if recommended. The use of an AED drastically increases the chance of successful resuscitation of a victim. Provides instruction on CPR, use of an AED, and response to a choking victim for Professionals responsible for the care of clients or patients. 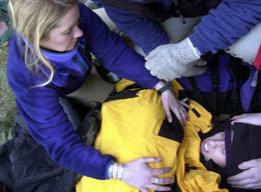 This course is intended for those in the medical field, as well as, care providers, public servants, and outdoor guides.